Fiber optic cable in essence, is a hair-like glass conduit that carries virtually any type of signal from one point to another at light speed. In case you are wondering why light traveling through fiber optic cable does not actually travel at true light speed, it is because the glass that makes up fiber optic cable is denser than the vacuum of outer space where light can travel without disruption. 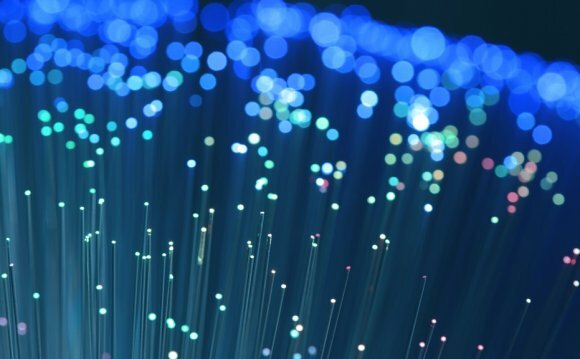 Needless to say, a fiber optic light signal is still much faster and far superior to a copper based signal, which is why it has become so popular in the cable television, telecommunications and computer networking. Unlike copper based signals, fiber signals are not affected by external power sources or surges and there is no need for shielding or grounding. How are Fiber Optics used today? Today, practically every communication network contains fiber optics. In most cases, fiber optics are used because of their convenience. Fiber optic cable allows network builders to divide their network into smaller service areas that prevent large numbers of customers from being affected in an outage. The result is better service and customer relations. Fiber optic cable also gives them a fast return path which they use for internet and telephone connections, thereby increasing their revenue potential. Local Area Networks (LANs) use fiber optics primarily in the backbone of the network, but the use of fiber optics to the desk is increasing. The LAN backbone often needs longer distance transmissions and more bandwidth than copper cable is capable of providing. Fiber easily offers the higher bandwidth needed to prepare the network for the much higher speeds projected for the near future. The use of fiber optics is not just limited to communication networks. Cable and telephone providers often use fiber for its distance capabilities. Distance is also an advantage to industrial plants that use vast amounts of fiber primarily for its noise immunity. Utilities also prefer fiber for noise immunity, security and high bandwidth properties. The military uses fiber because it's nearly tap-proof and impossible to jam. Fiber is even used by the aviation and aerospace industries because of its smaller size and weight. What are the advantages of Fiber Optics over Copper wire? Fiber's extra distance capability and seemingly unlimited data rate makes it possible to do things not possible with copper wire. For example, you can install all the electronics for a network in one communications closet for a building and run straight to the desk with fiber. With copper, you can only transmit about 90 meters (less than 300 feet), thus requiring more telecom closets in each building. With fiber, you only need passive patch panels locally to allow for moves. Upgrades can be rather difficult with copper wire, but not with fiber because the real capacity of fiber is only partially utilized at today's network speed. Many use fiber to connect all their central offices and long distance switches because it has thousands of times the bandwidth of copper wire and can carry signals hundreds of times further before needing a repeater. The cable and telephone providers use fiber because it gives them greater reliability with the opportunity to offer new services, like digital phone service and internet connections. They also use fiber for economic reasons, but their cost justification requires adopting new network architectures to take advantage of the fiber's strengths. Where to plug Ethernet cable? Where to buy Network Cables?